Lely Farm Management Support (FMS) teams provide one-on-one support, tailored to each specific operation, before, during and after robot installation. Lely’s local FMS advisors work with customers to lay out a program three months before startup and throughout the first year, making several visits and providing assessments and conducting webinars until the farmer is comfortable to run the herd and robots. Best practices to maximize milk production, reproduction and overall profitability. 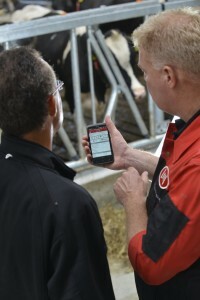 FMS will help producers learn to use the Lely T4C management system in daily business. In addition, FMS advisors will help customize Lely T4C InHerd to the farm to get the maximum benefit from this unique herd management tool. When the time of the initial milking comes, advisors will explain the protocol, and will build a customized plan that covers how to create different groups in the barn and how to organize staffing. The FMS advisor will be on-farm to assist during the move to robotic milking to help train cows for the quickest transition possible. that need to be adapted or changed. A tailored plan will be made according to each producer’s barn layout and logistics. Besides start-up support, FMS advisors are trained to assist in pinpointing improvements that can be made on farm to maximize herd efficiencies.